The vacant site off Airport Road S.E. where Panera Bread Café is to be built. As expected when a big sign went up in the spring, the Albany Planning Division has now received a site plan for the construction of a Panera Bread Café. The restaurant is to be built at 320 Airport Road S.E., where the vacant building housing the former Tom Tom Restaurant was demolished in December 2012. The plans submitted to the city by Panera’s architects, from Grand Rapids, Mich., show the proposed Panera building along with a drive-through, landscaping and 46 new parking spaces. As usual, the city mailed a notice of the plans to property owners within 300 feet. The application will be reviewed by the planning staff. The property is zoned for regional commercial use, and approval by the planning commission won’t be needed. But downtown has nice streets and benches and lights! Panera Bread will do great in that location and provide jobs, and they know they will do great before they submit for the permits to build. I am happy for that property to be used again! 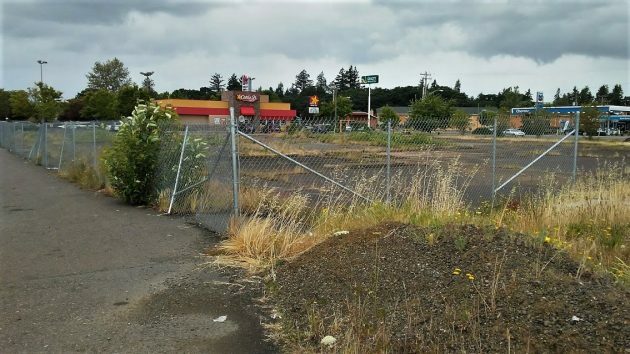 It should be a prime location with Kohl’s, Winco, the several fast food places & Costco. Not much call for me to go downtown except for my church & beauty shop being there. Hopefully, the Tom Tom sign will go away! I have never patronized Panera Bread but will give it a try!